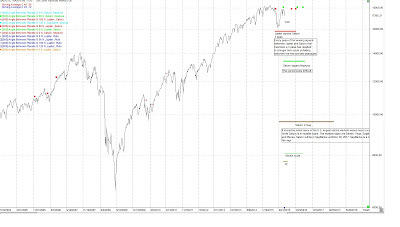 For the SP500, cycle-wise we are entering the 16th week of Primary cycle 1 cycle that started on Aug 24th. 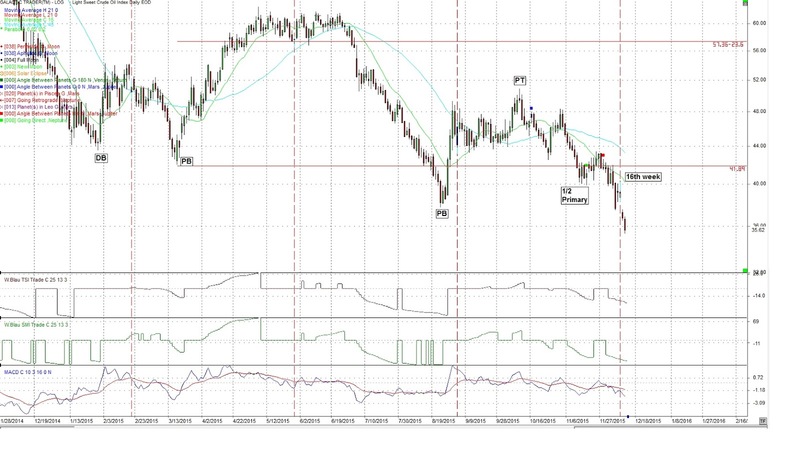 This cycle is aka, the nominal 18 week with a range of 15 to 21 weeks. This is the chart we have been following for many months. See the red line and dates on the chart. It is anticipated we will have a Primary cycle low between Dec 7, 2015 and Jan 15, 2016. Since we are in the 16th week, with a dramatic move down on Dec 11, it appears we had the Primary cycle crest on Nov 3rd (i.e. crest for this Primary cycle). 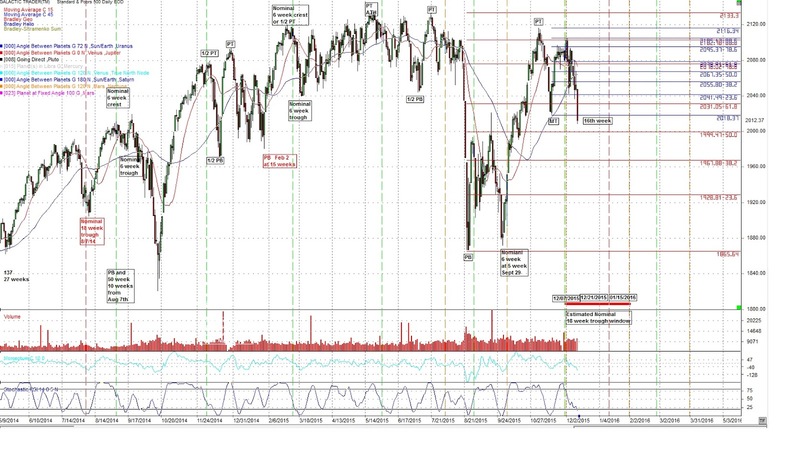 Note in the bottom right corner of the following chart is the forecasted time frame for the Primary cycle low. We should expect a Primary cycle low within a few weeks. When we hit a trough I expect a left translated cycle and moves further down in the New Year. This coming week much depends on the FED announcement and the markets reaction to it. We have mentioned a number of longer term cycles in previous blog posts and below. Dec 14 Sun waxing square Jupiter." Dec 7, the first trading day after Dec 6th was down and started a multi-day move down. Dec 10th was one day off the Dec 11 move down. Dec 11 was a New Moon in a Sagittarius, a mutable sign which often adds volatility to the markets and large price swings. This New Moon was also sextile Mars and trine Uranus bringing these powerful energies into the New Moon. Mars and Uranus were in opposition. Dec 14th has the Sun squaring Jupiter which often has a powerful effect on US indices, both up and down. Since we are in the 16th week of the Primary cycle watch for a potential Primary cycle trough within 10 td's of Dec 14th. The Sun squaring Jupiter it has a history of 1/2 Primary or Primary cycle turns. Much will depend on the FED's meeting and announcement on raising interest rates and when. They may be announced but delayed. Whatever options comes out of the FED meeting on Dec 16th I believe we will be going down into Jan or starting early Jan '16. Another option is we get a high near Dec 22, 23 where we have a number of transits to the ISIS formation group, then down. The transits are volatile and military and may make for a difficult Christmas period. Shorting is the only thing I would do with the US market indices but at this point I'll watch. The only thing I'm long right now is Gold as it looks like it just put in it's Primary cycle trough. Remember the Saturn / Neptune square "is often found near changes in inflation and or interest rates and money valuation problems in general". Gold going up or down is a money valuation issue. So is a change in interest rates. The FED increasing interest rates will of course be a negative for Gold and other world currencies. With Mars, Uranus and Pluto in aspect an explosive event may be imminent. I would also expect the markets to be volatile over the next few weeks as well. Attacks from religious terrorists and general strife and discord should continue into December 2015 and again in mid-April 2016 when Mars turns stationary in religious Sagittarius (a mutable sign) and makes difficult aspects, conjunct Saturn and square Neptune. This is not a direct forecast, but points to a period of time where these events are more probable to occur. Uranus square Pluto; the square will not get to an exact position but continues to get close and may be emphasized around Jan 25, 2016. It's effect should be felt and seen most of the first half of 2016. 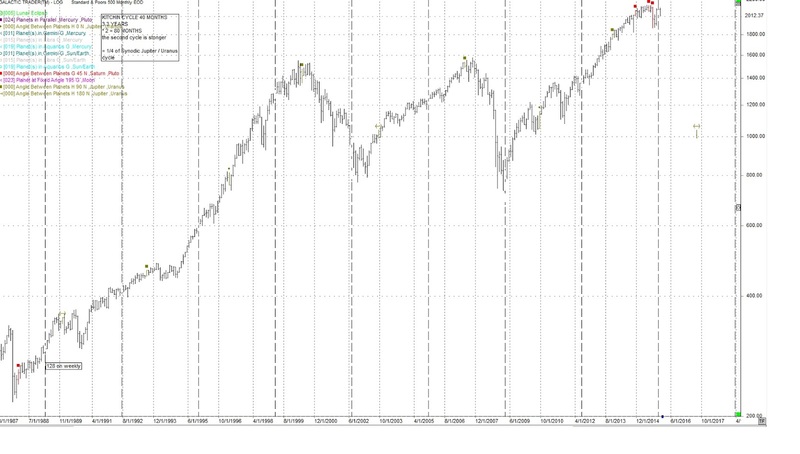 This is a 32-37 year cycle and has correlation to capitalist economic cycles and will be in a downward phase until January 2020. There are many reasons 2020 should be a turn around or significant year. We will start analysis of the important events leading into 2020 in the next few subscriber reports. Saturn waning square to Neptune will be in effect for most of 2016 but it's effects should lessen after September 2016. This transit has much to do with socialism and it's development. This is also a transit of deceit, illusion and delusion. This can be depressing and it's effects can appear as no one is in control. Jupiter waning square Saturn will get to the second exact square of a 3 pass in late March 2016. What we have had on the longer term charts for some time " Every pass of the waning square between Jupiter and Saturn that has been a 3 pass has resulted in a longer term cycle unfolding between the first and last passages." The first and last passages are August 3rd, 2015 and May 26, 2016. The lows in August and September 2015 may have been it. These two planets have long been known as the business planets and have a 20 year cycle length. It has been suggested every 3rd cycle equates to the Kondratieff cycle, that is 20 * 3 = 60 years. I'm not sure of the latter but I am sure there is a 240 year cycle with Jupiter and Saturn that is exact in 2020. More of this important event in future posts where we will discuss the Jupiter / Saturn conjunctions changing signs. Taking all 3 of the transits together 2016 should be another difficult year as we work through many challenges which may result in changes in government, economic models and technology. There are many other Astrological aspects and events in 2016 but these are the longer term aspects affecting the first half of 2016 as seen on the following chart which has been in previous posts for many weeks. Simply the placement of planets in signs during the course of a year can have a dramatic effect. Saturn is in mutable signs. The mutable signs are Gemini, Virgo, Sagittarius and Pisces. Saturn will be in Sagittarius until Dec 20, 2017. And Neptune continues to transit through Pisces (a mutable sign), the sign it rules. Neptune rules crude and water amongst other things. The week of Dec 21 could be another hot spot with hard transits to the ISIS formation chart. This will also be a test if the date and time for the ISIS formation chart are correct. Saturn is in Sagittarius which rules the law, religion, philosophy and science. With the square to Neptune is a good signal for a religious message that gets perverted. Other longer term cycles that may be close to seeing their lows in the next couple of months are the 6.5 - 7 year cycle and the Kitchin cycle (40 months). I'm looking at the period from mid-December through Jan 2016 as a potential time period for these cycles. They are long term cycles and need a broad orb. 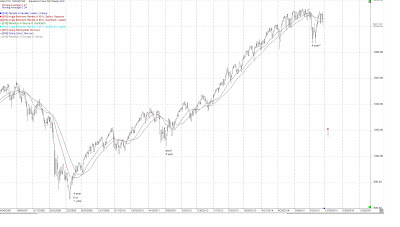 The Kitchin cycle on the SP500 chart. This is a monthly chart. cycles may appear closer than when they actually due. 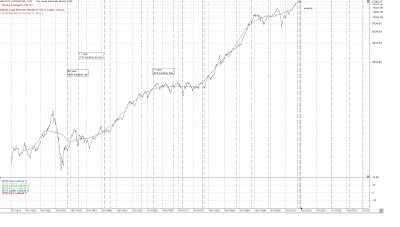 Other long term cycle due, including the 6.5 - 7 year. 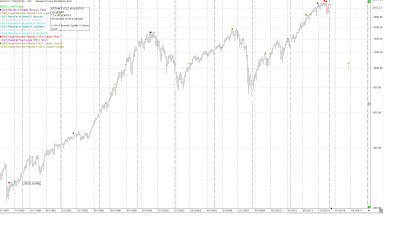 Longer term cycles on a monthly chart of the DJIA. These need a wide orb. The following weekly chart shows the 21 and 34 weekly moving averages and the fact price broke through both averages but moved down through the averages this past week. 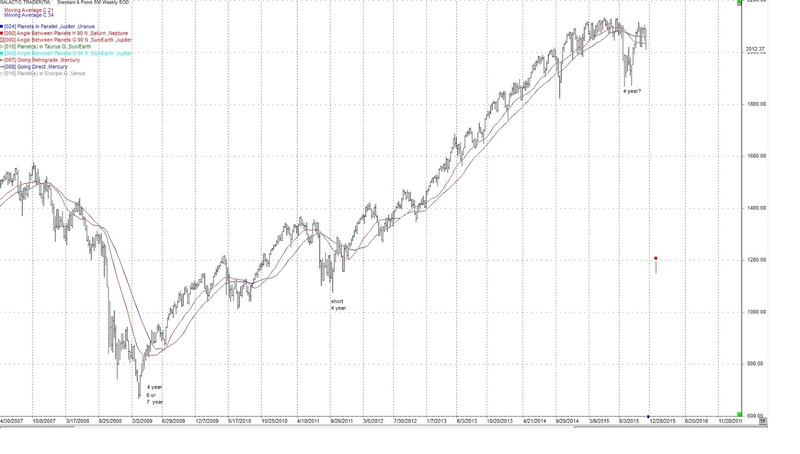 Also the 21 and 34 week moving averages are still pointing down or flat. This was looking like a 4-Year low but now we've broken down through the averages, it may be a test of the lows or moving to a deeper low. The question is, do we have a significant low in front of us. At this point I think yes and it could be the December '15 - January '16 time frame. Neptune is prominent particularly in the second half of November 2015. We've mentioned watching Jupiter and Neptune aspects and events for swings in crude. High and low. We've also noted Neptune often brings illusion, delusion, lies, deceit and falsehood. Neptune also rules water. This could be showing a lack of water or too much as would be the case in large storms. Lack of water, or a problem with water, is going to be a major problem in the not too distant future. At this point, following are the highs in the US indexes. One of our subscribers forwarded a report from another Astrologer, which amongst other things made the case for sharp market moves when the Moon is in Virgo (a mutable sign) and Saturn is in a mutable sign. Astrological events occurring in mutable signs can result in quick changes to financial markets, violent weather and geophysical events. 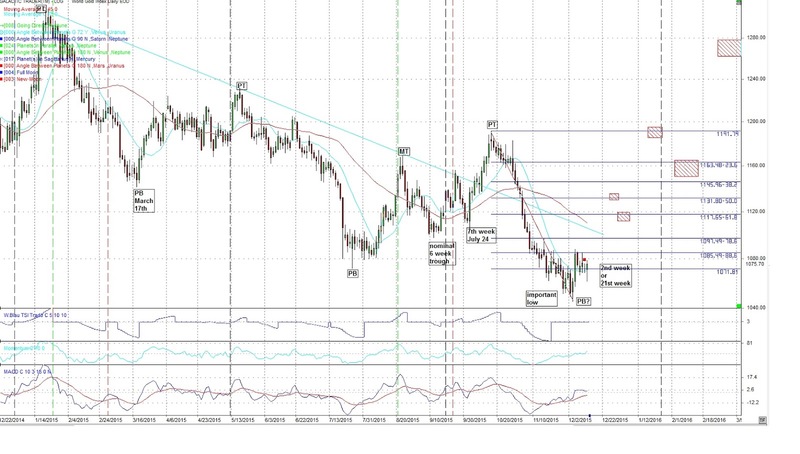 Gold put in a Primary cycle 1 trough on July 24th. 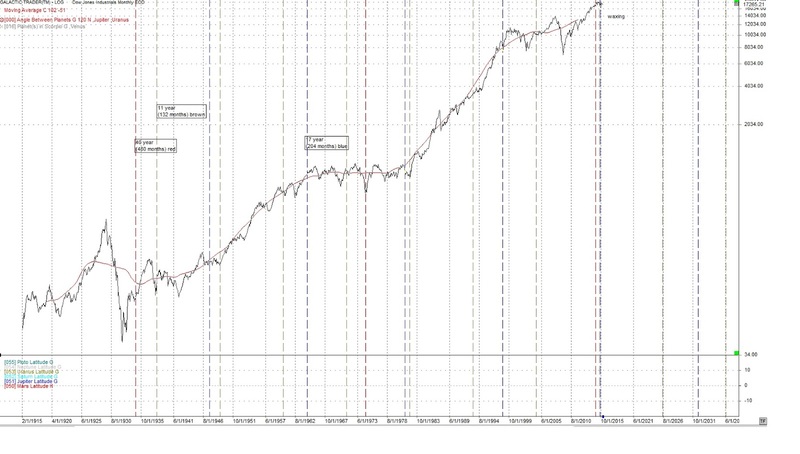 We are entering either the 2nd week of the nominal 18 week cycle or the 21st week of an older primary. It appears Gold put in a Primary cycle trough on Dec 3rd in which case we would be heading up in the first week of a new Primary cycle. This is too early to confirm but we were late in the existing Primary cycle and just made a strong, but two day move on Dec 3rd and 4th. I had brought up the possibility of a spike low in the subscribers letter, during the week, before we start a new Primary. We got the spike low on Dec 2nd, which I bought. The pending FED decision will have an impact on the price of Gold. This could delay or mute what is normally a bullish move at the start of a new Primary cycle. 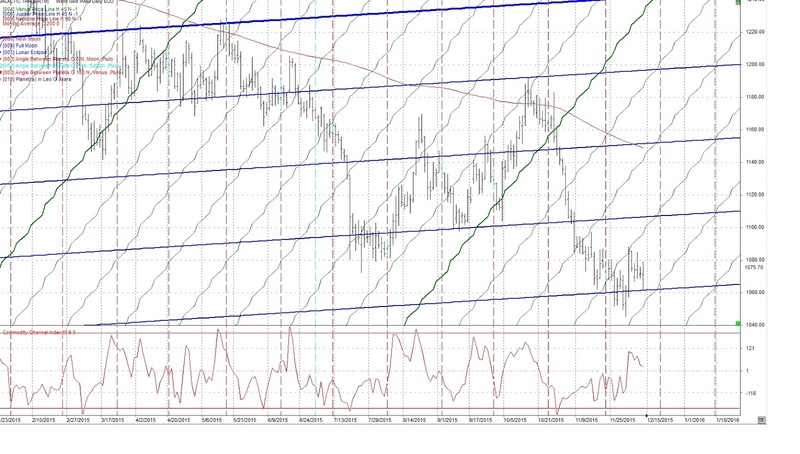 On the following daily Gold chart notice Gold has broken down through four Venus price lines. 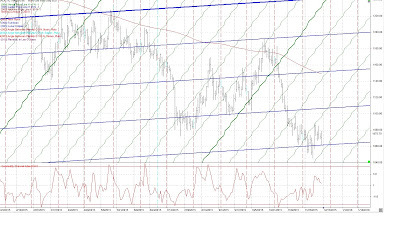 Gold went below the Jupiter price line (blue) regained the Venus price line and Friday touched the Jupiter price line (blue). I'd like to see Gold follow a Venus price line up or jump to the next higher Venus price line currently near 1097. As mentioned the FED does not want to see Gold prices rising and we may have to wait for Wednesday's announcement. I'm expecting the bigger move in Gold next year possibly at the end of the next primary cycle which may also be a 17 month cycle low. The move should be up. Subscribers have the potential dates. 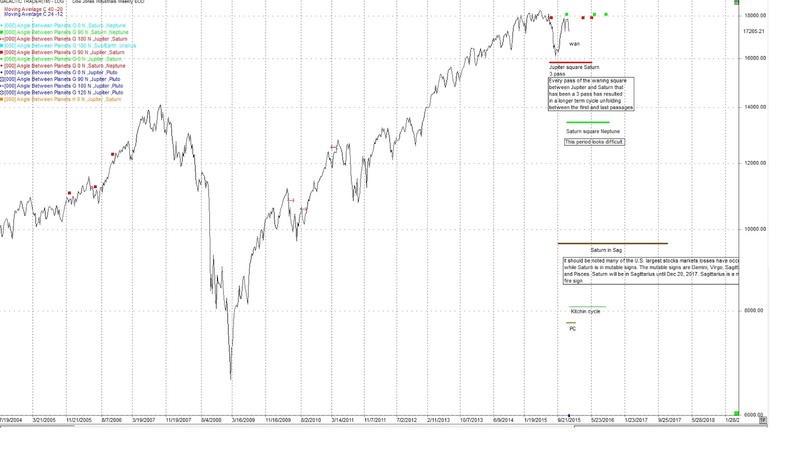 This coming week of Dec 14th we should be entering the 16th week of a nominal 18 week cycle which started August 24th. "In the second half of November, Neptune will be highlighted as it changes to direct motion, Saturn squares Neptune (Nov 26th) and the Sun squares Neptune while conjunct Saturn on Nov 29th. " Crude has gone straight down since late November. I expect crude to be quite volatile. With Neptune active to this degree I would also expect our old friends, illusion, delusion, lies, deceit and falsehoods to be apparent. If they ever left. As mentioned Neptune is in Pisces, the sign that it rules and is most powerful here. 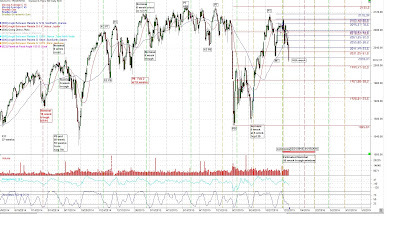 Looking out at the major transits in 2016 I'll be looking for a bottom in crude in 2016. I've mentioned to look at dates near aspects to Jupiter and Neptune, the two planets that rule crude. Subscribers have a list of those dates to the end of the year. It is difficult to forecast Crude here with all the geopolitical events, OPEC and our climate change friends. I'll be changing focus to NatGas in the next few weeks. NatGas is very local so we'll look at NatGas prices in North America. We should start looking for potential Primary cycle lows over the next few weeks, although crude prices may have further to go down with the current Astrological aspects and therefore may have a longer Primary cycle. Looking at heliocentric aspects there is a very interesting date on January 29th, 2016 +- a few. 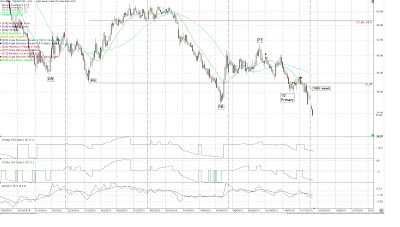 Other items, more specifics on the SP500, Gold and crude also US$, NatGas, Coffee reserved for subscribers. At $99.00 for a 6 month subscription, can you afford not to have it? The 1st half 2016 dates and subscription to the monthly letter (starting in Jan) will be available for purchase Dec 20th.